My make-up pouch can carry 35 items. Yours? 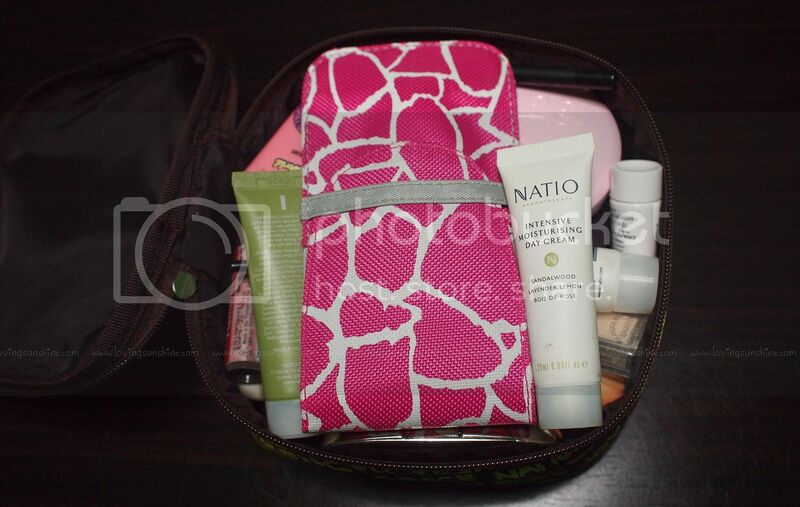 If you want to update YOUR cosmetic pouch, join my giveaway here. It's been raining sporadically hard lately and I can't believe my Pinay and Proud kikay kit bulged up this heavily! At first I was just so thrilled that my cosmetic pouch could carry so much--can carry my lunch box even, but now I feel a mix of pride and shame to count that my pouch has 35 items in it! In my defense, I counted the contents of my Charm Pocket Brush per piece. Continue reading for the breakdown. 1. Revlon Tweezer - I find myself randomly needing a tweezer every now and then, and have long planned to carry one with me but I always forget! Finally, I remembered to pack one along. Anyone willing to gift me with a cute Tweezerman is welcome hehe. 2. Charm Pocket Foundation/Large Eyeshadow/Concealer Brush* - like any brush from Charm Pocket Brush, this one's a slasher. I use it accordingly. 3. 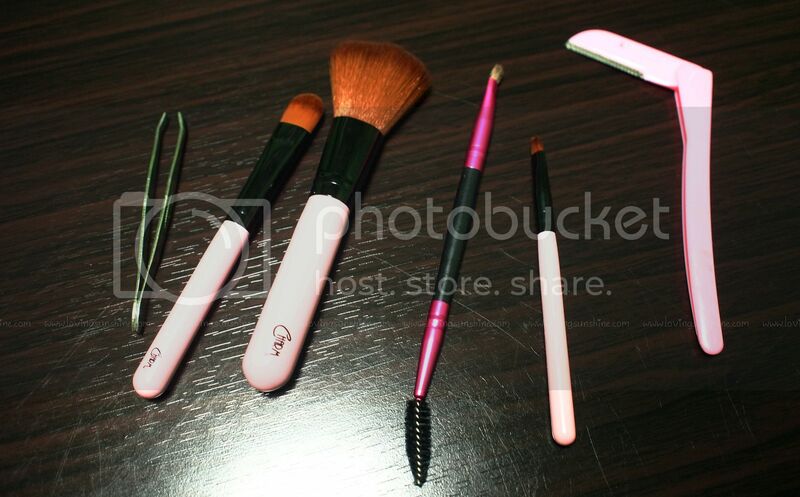 Charm Powder/Blush/Foundation Brush* - like any brush from Charm Pocket Brush, this one's a slasher. I use it accordingly, as well. 4. Charm Dream Brow Brush Duo - I LOVE this brush. I have ugly sparse and uneven brows. I blame my past mistakes and the shameful mistakes of other people who bothered trim my brows on their own terms. This is a savior. The spoolie is great in combing your brow hairs (whatever's left of it) in place. The brush end is the right amount of texture to pick up power and line the brows. 5. Charm Liner and Lip Pocket Brush* - sadly, I love my Charm Pocket Lip brush. Sophie knows this and was so kind to console me about it :( I also use this accordingly. 6. Etude House Portable Razor - this is for days when I need to shave off unwanted hair. why I have a tweezer and a razor at the same time bewilders me. Although, I do find myself using the razor for cutting random things too. It's so sharp! This is an amazing Etude house tool, once again. 6. 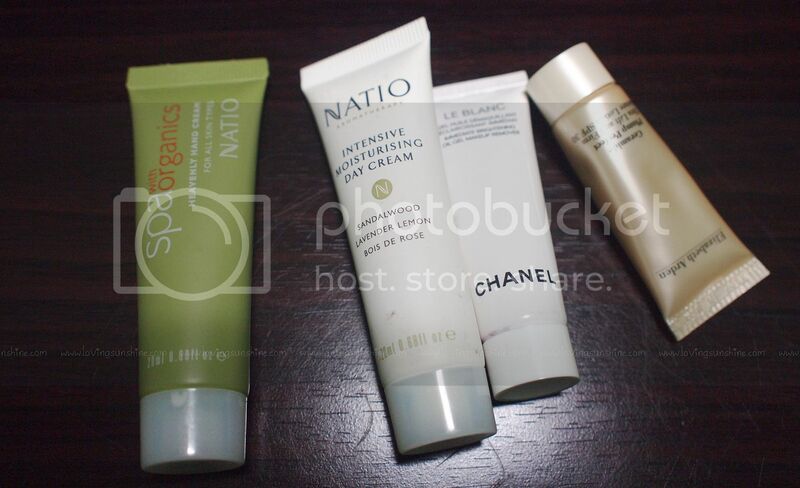 Natio SpaOrganics Hand Cream* - I absolutely am in love with hydration this time of the year. You would think because it's raining hard, my skin's not dry. But on the contraire, skin gets drier when it's cold. This hand cream is among the most relaxing ones I have tried. Absolutely love the Spa-like scent. 8. The Body Shop Vitamin E Eye Cream (not in photo) - is now part of my hefty daily cosmetic grind. 9. Le Blanc Chanel Eye Gel - I can't begin to explain how important it is for me to remove all traces of dirt and make-up on my face before sleeping. Sure, sometimes I'm hit by the lazy bug, but on a normal day, I'm very meticulous when it comes to cleansing my face before I sleep. I'm glad my older sister have me try this lovely Chanel tube. It's divine in melting away waterproof mascara. Although, I have to be extra careful because it can sting the eyes like hell-oooo! 10. Elizabeth Arden Ceramide Plump Perfect Ultra Life and Firm Moisture Lotion with SPF 30* - this heavily named product is a lovely SPF lotion. It smells like your regular swimming pool-friendly SPF (smells like medicine, like chemicals!) but surprisingly, it's NOT sticky and it is absorbed absolutely well by the skin. What I love most about this little darling is it doesn't leave me looking geisha white like most SPF d when you slather on a generous amount. This was also from Krystal. It is by this portion of this post when I realize I didn't number the products. I'm just going to rely to your gracious wit to realize which of the bunch I'm referring to. I'm sure you are all smart people! To help, I'll be listing the products from left to right, clockwise. 11. Guerlain Rouge Lipstick in Bella B63* - I love the elegant packaging of this lipstick to pieces. It has a wonderful built in mirror with it. The only painful fact is that it's very heavy, but I don't mind. I like having something precious with me every day. 12. Majolica Majorca EyeShadow* - this eyeshadow was part of my previous Purse Favorites post. Still, it has yet to leave my side. I love this to pieces. Read about my June Shimmer post here. 13. 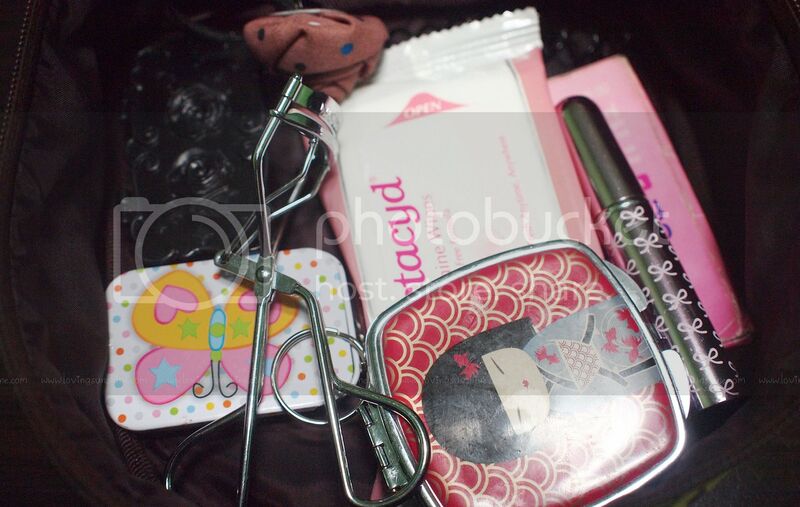 Etude House Perfect Brow Kit - this was a surprise gift from Etude House Philippines. Something I raved about from the moment I had my hands on it. 14. Etude House Compact Powder* - this is part of the June new products kit gifted to me so I'm heavily road testing it. Controlling a shiny face is serious business for me and I'm happy to report that this powder has been performing quite well. 15. Human Heart Nature Love Minerals in Petal Bloom - I have lost track how many Petal Blooms I've used up. This is super cute! I love how natural yet perky the color this delivers. 16. Human Heart Nature Tinted Lip Nalm in Flame Tree - it's such a shame, but I recently found an UNUSED Flame Tree among my stash. When I found out it's going to expire this coming September, I felt guilty that I didn't even use it! So I decided for the whole month of August, I'll be wearing red lips. I hate being wasteful and I hope using Flame Tree for the whole month would compensate to my complete neglect of it for the past year! 17. Natio Paw Paw Lip Balm* - this is the most moisturizing squeeze-tube lip balm I have ever tried! Surprisingly, it's very thick but not sticky at all. The last time I was sick and dehydrated, it's THIS product that saved my lips. 18. Garnier BB Eye Roll* - I'm currently using another eye cream that is caffeine powered, will post about that separately, but it is because of that that's why I decided to rekindle my fascination with this BB eye roll. I am hoping their common active ingredient, coffee, will be reinforced every time I used them side by side. 19. The Face Shop HD BB Cream - this is the best BB cream from The Face Shop! It's not too fair and it blends perfectly on the skin. I can't believe this but I'm actually almost done with this small tube. How hard it was to use up a tube-full of BB cream? Very. 20. Coastal Scents Liquid Eye Liner in Jet - I got this immediately upon release. In fact, I got all colors! So far, black is still the best color for liquid liners for me. 21. Maybelline EyeStudio 2-in1 eyeliner - This is very creamy and pigmented. I love using this first and as a guide to when I use my liquid eyeliner. Using this pre-liquid lining creates depth and definition along my eye contour. 23. Hair Pin Plastic case (black) - I always have hair pins with me. My hair is very unruly so I always make sure I have hair pins around. They're very functional! 24. Pinkbox Butterfly case - I love this for my ponytails. I also have some elastics stored in it, for days when I suddenly want to braid my hair or something. 26. Rose bud Ponytail - isn't it lovely that this rosebud ponytail is also in what seems to me as an old rose color? Anyway, I know, why am I so prepared hair wise??? Well, I will repeat what I just said. I have unruly hair! 27. Lactacyd Feminine Wipes - I love how refreshing using this is. 28. Kimmi Doll Portable Mirror - this is one of the two essential mirrors in my bag. I have another mirror that my friends all know and refer to as the princess mirror. My gosh, I've had it since high school! I'm so pleased I haven't lost it, til now. Who knows, it may eventually be an antique, and an heirloom! Wow! 29. "Princess Mirror" (not in photo) - details mentioned above. Would you like me to blog about it? 30. Etude House Atomizer - I love how cute this little bottle spray is. Inside it is a Clinique face mist. 31. J&J Oil Control Film -this was also part of my June Shimmer Purse Favorites post. 33. Fcuk Her Perfume (not in photo) - I also don't know why I have two fragrances riding along my daily escapades, but a girl like me love my options and this and item number 32 are the options I get to choose from every day. 34. Oral B Dental Satin Flosh (technically in photo, but hidden behind the bunch below) - I never leave my house without a dental floss! I feel so uncomfortable without one! 35. Paganini Detangler Comb (not in photo) - you really didn't think I go out without a comb. I always bring this lovely Paganini detangler comb for wet and dry hair because it's the only comb that was satisfying for my almost always tangled up locks. I should probably talk about that comb in a dedicated post as it deserves the recognition for being such an amazing comb for less than $2! Now when they said you know a person by the contents of her purse, would you be so kind to comment what you think of me now??? wow you bring a mani kit? thats so cute! i should consider having one too! How long does it take for you to use up a whole pan of Human Nature blush? I want to buy a blush from them (they have such pretty colors), but it takes me more than a couple of years to hit pan on blush. Human Nature blush expires in one year, and it would be such a waste to just throw the remainder away once it expires. yey to us being pinay and proud! True kikay,andaming pink oh!..nice purse pinay and Proud! 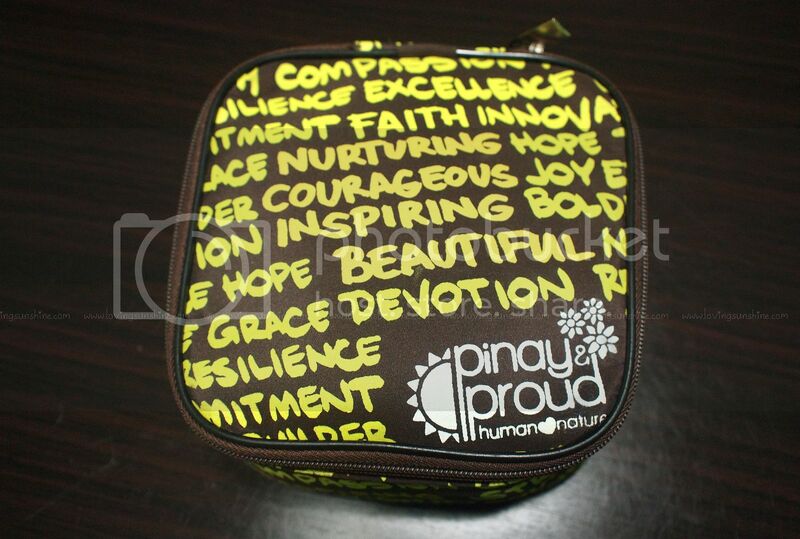 love it.nice din ng contents hehe.i also carry a lot of stuff that's why i love big bags din! Hi Kumi!! Yay!! 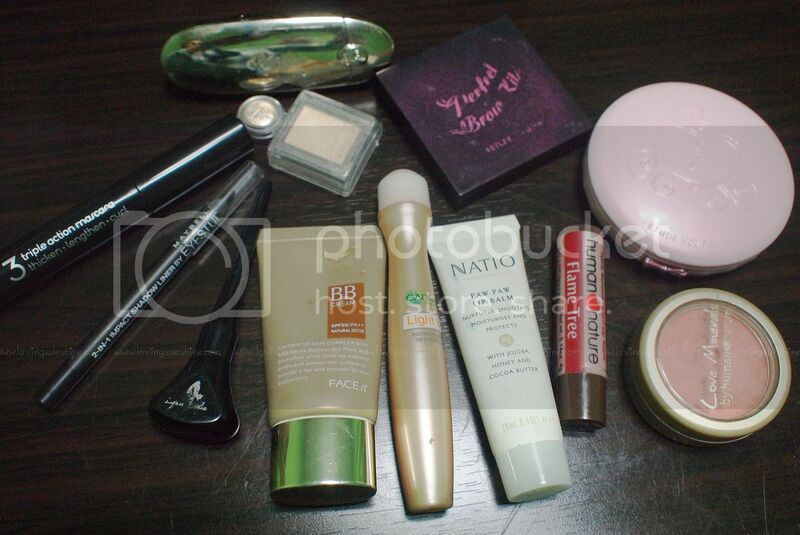 Ako puro lip products lately.. your kit looks so complete! Girlscout! kasi i ended up getting stranded very often haha ang lakas ng ulan lately! That's a lot of stuff! I just have antiseptic gel for hands before I eat, and a lip balm, either Nivea or Burts Bees... that's it.